Trish loves softball. She is a twelve-year-old dynamo on the field and a pretty great kid off the field. She is serious about the game, but not obsessed with winning. Overall, she is mature for her age, but when she makes one bad decision it affects all aspects of her life. 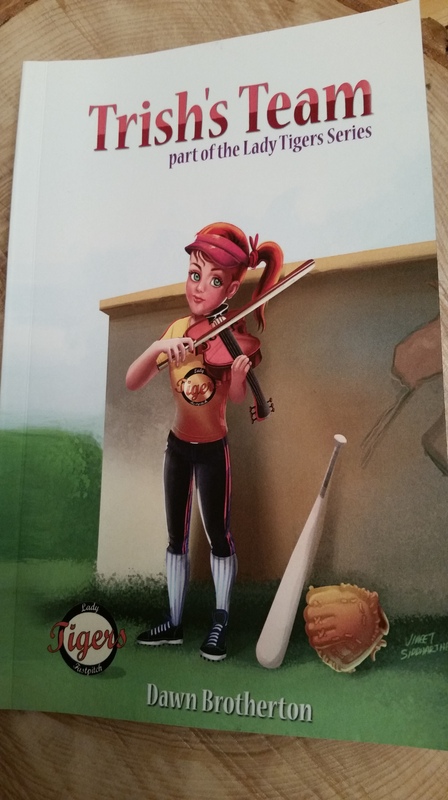 In order to join the Lady Tigers Softball team she has to give up her violin lessons. Giving up her involvement in the orchestra that has been a part of her life for several years would be a hard thing for Trish to do. She loves playing the violin, and her parents have invested a lot of money in lessons and her instrument. Her parents are very busy. They are too busy to be around on the weekends and evenings due to meetings, golf games and exhaustion from their demanding lives. Most of the time this has worked out ok, but unfortunately Trish takes advantage of their inattentiveness to deceive them. She feels guilty and conflicted after making this choice, and soon it becomes a house of cards, threatening to crumble. Will she be able to make amends before it is too late? This is the first book in Brotherton’s Lady Tigers Series. It is a solid story with interesting and engaging characters. The interaction of Trish with her friends and parents is refreshingly honest and reads like She shows empathy and feels guilty when she does something wrong. When her lies start to catch up with her she becomes physically sick. It is written for young readers, deftly showing how one decision can affect many other things and people without being “preachy”. It also demonstrates how conflicted tweens are; mature and childlike while struggling to find their way to adulthood. This is not a heavy book, but it addresses many social issues in interesting ways. For example, the kindness of Trish and her friends to a new girl that someone else is not being nice to is understated but very important. This is the first book in Award Winning Dawn Brotherton’s Lady Tigers Series. She also writes the Jackie Austin Mystery Series. She is currently serving as a colonel in the United States Air Force Reserve and is married with two daughters. I am looking forward to the next Lady Tigers book, and highly recommend it to tweens. I am also adding the Jackie Austin Mystery Series to my list of books I want to read. I can’t wait to read more of Brotherton’s books. Laura, Sounds like a super fun read. I’m not a big softball fan, so I appreciate the glossary in the back. Sounds like a great book for girls! !